Unlike polychaetes, the clitellates exhibit a relatively uniform body plan with homogeneous segmentation. The oligochaetes and leeches are united in this class by the clitellum, a reproductive structure that produces mucous cocoons. Clitellates are hermaphroditic, with single individuals capable of producing sperm and eggs. Development is direct (no tro-chophore larvae) from eggs deposited in cocoons. in burrowing, and earthworms are thus able to perform the ecologically important functions of aeration and decomposition in soils. 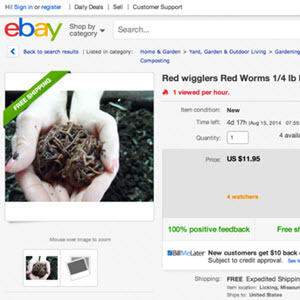 The Euhirudinea, or true leeches, are carnivores that derive nutrition from blood-feeding on vertebrate or invertebrate hosts or by ingesting small invertebrates. They are closely related to the Branchiobdellida (a group found only attached to the gills of freshwater crayfish) and the Acanthobdellida (represented by a single species of Arctic worm). Presently there are more than 600 recognized species of Euhirudinea placed into two orders, the Arhynchobdellida and Rhynchobdellida. Leeches lack chaetae and exhibit a fixed number of segments with reduced internal divisions. Further modifications include a caudal sucker and posterior sucker for attachment; the caudal sucker is also utilized in feeding. Leeches are generally restricted to freshwater environments, but some inhabit marine waters; a few are found in terrestrial areas of the tropics. Among the Arhynchobdellida, the families Haemopidae and Hirudinidae possess serrated jaws used to pierce the body of hosts. The Rhynchobdellidae contain the Glossi-phoniidae and Piscicolidae, members of which bore into the tissue of hosts through the use of a muscular proboscis. Many blood-feeding leeches have formed specific host-parasite relationships, and some species act as vectors for blood parasites of vertebrates. The benefits to man from leeches include the detection of polluted habitats as well as their use in microsurgery and in the development of anticoagulants. Southern Synthesis. Fauna of Australia. Vol. 4A: Poly-chaeta, Myzostomida, Pogonophora, Echiura, Sipun-cula. Melbourne: CSIRO; Fauchald, Kristian, and Greg Rouse. 1997. 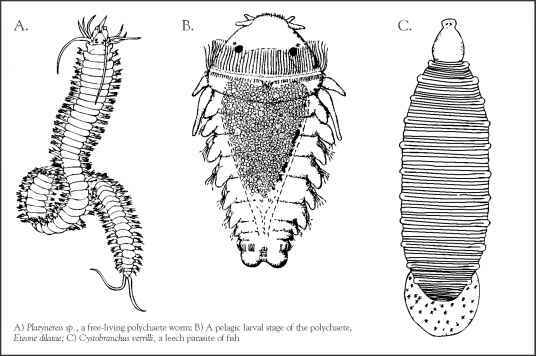 "Polychaete Systematics: Past and Present." Zoologica Scripta 26: 71-138; McHugh, Damhnait. 2000. "Molecular Phylogeny of the Annelida." Canadian Journal of Zoology 78: 1873-1884; Sawyer, Ross T. 1986. Leech Biology and Behaviour. Vol. II: Feeding Biology, Ecology, and Systematics. Oxford: Clarendon.